If you are new to this subject, you might wonder what is an electric skateboard and what is the difference between a regular skateboard and an electric one. The electric skateboard is typically the regular skateboard that is modified and equipped with an electric motor that gives it the power to move by itself, but at the same time, its moves and speed are controlled by a wireless remote controller by the user. So, like the normal skateboards, the electric ones are steered by the rider. Electric skateboards also have included batteries that need to be charged and the time that they last depend on the capacities of the batteries. The same thing applies to the remote controller, but its battery lasts longer than the batteries of the board. Usually, electric skateboards go up to a maximum speed that is found between 25 and 40 kilometers per hour (that is 16-25 mph), but this depends on different factors such as the terrain and how it presents itself, the weight of the rider, the angle of the climbing and so on. If you are thinking whether this is a safe product or not, you should know that usually it is safe to ride a skateboard, but is also important to be attentive and to prepare yourself with a helmet and safety gear for your knees and elbows, especially if you are a beginner. Down below you will find more facts and tips about electric skateboards if you are new to this and also interested in discovering more. 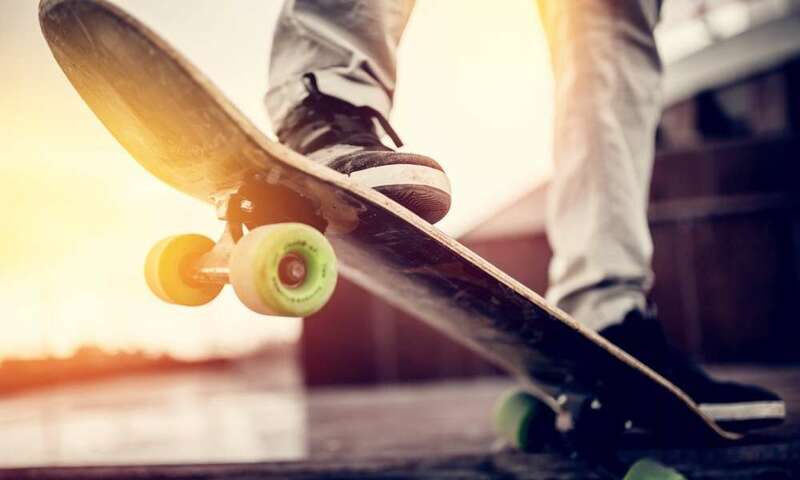 If you never set foot on a skateboard before, it is recommended to leave the remote controller on the side and learn the basic steps of riding a regular skateboard. If you try and repeat the basic steps slowly and steadily, you will be able to get comfortable with the board in no time. Keep in mind that people learn at different paces and if it takes longer for you to get comfortable with this sport, there is no problem. Get used to your electric skateboard before using the actual electric features. You must know the components of the skateboard before using it. These are: the deck and the grip tape (the deck is the part of the skateboard that you stand on and that is made out of wood, while the grip tape is part that is applied to the deck and it helps your shoes to stay in place and not slip), the trucks (they are those parts that help the wheels stay attached to deck and provide you smooth turns), the wheels ( it is recommended to star out with wheels that have between 52-55 mm in diameter) and the bearings (for starting up, the bearings that cost around 15$ are good enough). The extra parts that are added for an electric skateboard are the motor, the battery, the brakes and the remote controller (this is usually wireless). When it comes to the stance, feel free to try the best that goes for you and makes you feel comfortable, whether that is with the left foot placed in the front and pushing with the right foot, or with the right foot placed in the front of the board and pushing with the left one. The thing that is very important when skating is to push on the board and after you catch the idea, you can try to go into the tricks zone. When it comes to knowing how to stop, you can try and let all your weight on the back foot so that you will get a smooth stop. After you learned the basics of skateboarding when it comes to the electric operation, it is easy to blend in. The difference between the regular and electric skateboarding stops at the starting and stopping process. With the electric skateboard, there is no need to start by pushing the board. It is controlled with the wireless controller and from this point, you can choose what speed you want and you only have to concentrate on staying on the board with your feet. When it comes to the stopping process, instead of the regular process, you can stop with the controller that will make the motor action on the brakes. The speed that the skate will have may depend on the terrains and how much your body weighs. For the beginning, you should find an open space that has a decent terrain and start practicing. You have to activate the skateboard, step onto the board and find a position that makes you feel comfortable and start going with the remote’s options. Some skateboards have the option of going backward and this gives you the opportunity to make more tricks. Safety is important, not only for the beginners but for everyone that steps onto the deck of the skateboard and wants to go on an adventure. You should purchase safety gear at the same time when purchasing the skateboard. Try and get a helmet and pads for the elbows and the knees. If you are a beginner and you want to learn how to use an electric skateboard, it is important to learn the basic steps of regular skateboarding and only after that, adventuring with the electric stuff. It is easy to skate once you get how they work and how to feel comfortable on the board. It is important to know what elements a skateboard has and how they work. Keep in mind that not everyone has the same pace of learning and it takes you more time, that is not a problem. Learn how to skate and make the skating experience an enjoyable and relaxing one. Most electric skateboards can be used as regular skateboards, but you must always make sure that you are safe to use it in either way. Invest in some good quality safety gear even if you are an expert, but especially if you are a beginner.